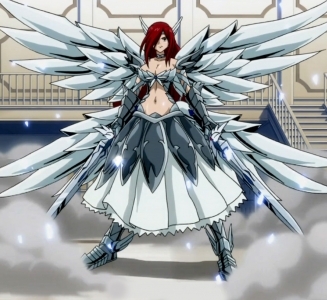 Erza Scarlet is a main character of the series and one of Fairy Tail's S-class wizards. She is a very strong individual, is very stern, and places great value on the rules of Fairy Tail; if someone steps out of line or is slow to do as she asks, she does not hesitate to punish them, so many characters are quick to apologize if they think that they have angered her. This comes up most often when Natsu and Gray start arguing, where they are quick to stop and make up if someone mentions Erza. Erza is not without compassion, however, and will do her best to make Natsu and Gray happy, even if it means delaying their punishment until later. She is voiced by Sayaka Ohara in Japanese and Colleen Clinkenbeard in English. As a child, Erza was one of the many slaves that constructed the Tower of Heaven. She was beaten frequently while there and eventually lost her right eye. During this she met a boy named Jellal who she fell in love with. She was eventually able to escape during a slave rebellion but was forced to leave her friends behind. Erza eventually arrived at Fairy Tail, and is given a false eye from Porlyusica. Her desire for armor resulted in her "re-quip" style of magic; with it she can instantly equip herself with armor or weapons in her vast arsenal. She is a talented warrior, being of comparable ability to guild leaders like Makarov. 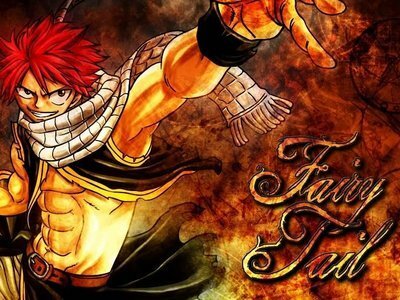 Her legendary status leads to her title of "Titania Erza", meaning "Queen of the Fairies". Her name was adapted from Eru, a character from a one-shot short story by Mashima that served as the basis for Fairy Tail.